Traveller's Tales is upping the ante in a Marvel Lego game with over 100 playable characters. When Lego Star Wars first launched, nobody really expected that Lego videogames would become a phenomena. Eight years and over a dozen entries later, many simply look forward to seeing which fan-favorite franchise will be converted next. 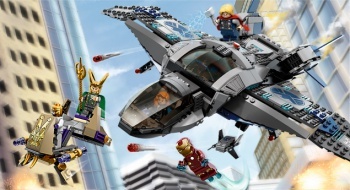 Thanks to the recent popularity of The Avengers and its Marvel Cinematic Universe, Traveller's Tales has now revealed that the next title in its Lego line will be Lego Marvel Super Heroes. Marvel fans will also be happy to hear that, unlike the films, this game won't be restricted to any particular licensed team. Instead, the title will feature characters from all of Marvel's comic book franchises, including Avengers, Spider-Man, X-Men, Fantastic Four, and even obscure titles like Guardians of the Galaxy. Lego Marvel Super Heroes, like the Lego Batman games before it, will present an original story rather than adapting a specific movie or storyline. The plot should be familiar to Marvel fans already: Nick Fury, unable to contain threats like Loki or Galactus, calls upon Iron Man, Thor, Hulk, and other heroes to save the Earth. It's not a unique premise for a Marvel game (Ultimate Alliance did the same thing), but Lego Marvel Super Heroes ups the ante with over 100 playable characters, the highest for any Marvel console title. The full roster will include heroes like Spider-Man and Wolverine, anti-heroes like Deadpool, and even Galactus himself, who presumably solves Lego puzzles by eating the planet. Further details, such as whether the game will have full-voice acting or open-world environments, are unclear at the moment. Given that it's a Lego title however, players should expect a wide range of puzzles, character-specific abilities, and playful Lego humor to be featured throughout the entire game. Lego Marvel Super Heroes is due out this Fall for PC, consoles, and handheld systems.